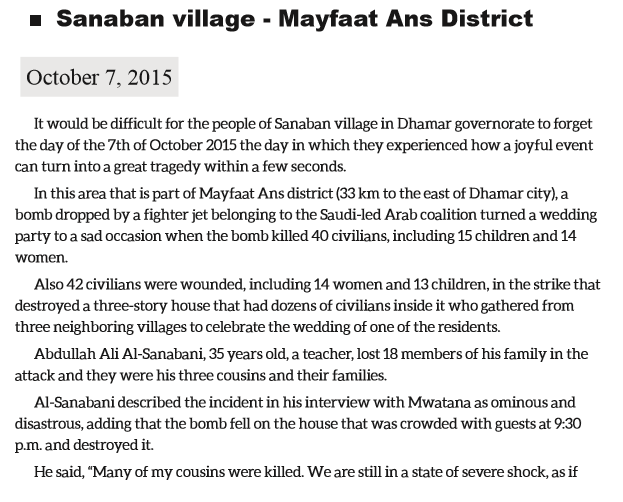 On 7th October 2015 another wedding party was hit by a coalition airstrike killing up to 66 civilians (33 women, 18 men and 15 children) in Sanaban, Dhamar province, northern Yemen, and injuring 54 others. It should have been a day of happy family celebration for 15-year-old Abdullah Qais Sanabani, a Yemeni schoolboy previously best known by his schoolmates for having once won a trip to Nasa’s US headquarters. His three uncles, dressed in smart blue jackets over traditional white robes and wearing colourful turbans, were holding a joint wedding ceremony and party. Their three brides, all from nearby villages, had just arrived in a convoy of 30 cars, beeping horns and playing loud music in celebration, when a power generator failure prompted Abdullah to leave the house with one of his uncles to see what was wrong. 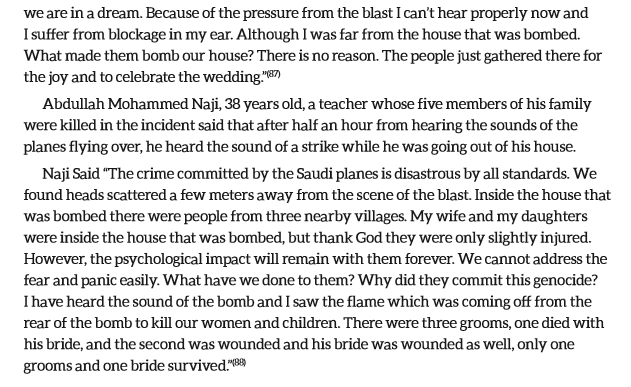 Moments later, at 9.30pm, the deafening roar of warplanes filled the air and missiles rained down from the sky on to the two-storey wedding house built on the top of a hill in the small town of Sanabani, 60 miles south of the capital Sanaa. Abdullah spoke to The Independent by telephone from bed in a Jordanian hospital, where he was flown for emergency treatment after the attack. According to witnesses, at least 57 of the wedding party – mostly members of the extended families of the brides and the grooms – were killed and dozens others injured in the attack earlier this month. Bed-ridden and still swathed in bandages, Abdullah suffered first-degree burns in the face and body and said he was afraid that doctors might amputate his hands. “I am in pain all the time. My whole body has been scorched,” he said. Abdullah’s father, Qais Sanabani, said most of the dead in his family’s wedding party had been women because, according to Yemeni traditions, men must leave the house when the brides first arrive. As well as Abdullah’s uncle, one of the brides and 10 other immediate family members perished, including his grandparents. A health ministry official in Dhamar, Mohammed Gamah, said the final death toll had risen to 66 – 33 women, 18 men and 15 children – and 54 others injured. A picture shared by Mr Sanabani showed half of the bombed wedding house still standing amid rubble, with cooking pots and pans, clothes and the smashed remains of furniture scattered around and the charred skeletons of several cars nearby. The building is half an hour’s drive from Dhamar, known as the seat of Shia sect of Zaydism, practised by the Houthis, in Yemen. Zaydis compose a third of Yemen’s population, while the majority are Sunnis. The nearest army camp that might have been a military target is 23 miles from the house. Abdullah’s visit to Nasa in 2011 made headlines in Yemeni newspapers, one of which quoted the boy saying: “My trip to Nasa is a source of pride to Yemen.” According to his father, Abdullah spent five days at the Nasa headquarters after an Indian institute awarded him a “Global Icon” certificate for coming top in a scientific competition. “He was so happy to go to Nasa and for him, this was a turning point,” Mr Sanabani said. In school, he added, his son excelled in scientific applications, making models to show how to generate solar energy. Mr Sanabani said that his son always dreamt of becoming an astronaut. From his hospital bed, Abdullah summed up his ambitions. “I wanted to do something that benefits human kind. So when I die, people remember me,” he said.